Moving during the holidays is a common event which can be a little bit tricky. Today, we’re going to talk about some ways to get through a holiday move. Many of the people who are willing to help you pack and move can already be committed to other events and plans. For this reason, asking for help as soon as you can, and being prepared to accept that helpers may have conflicts will prevent disappointments. Hire people from a quality moving company to help you pack, load, and move. While it will cost you more money but will prevent disappointment, or worse, not being ready when it’s time to go. Call the movers so you can get them mid-week when rates are lower if you want to try to save a few bucks. If not, that will be okay, too. Remember, even the movers are busy during the holidays, so call early to avoid disappointment. The important thing is to get it done. Moving during the holidays means a lot of extra stress during an already stressful time of year. The essential thing is to retain your sanity! Perhaps a scaled-back celebration is in order. Shopping, wrapping and packing holiday gifts and other items should be finished early. If you intend to decorate the new house (and no one would blame you if you don't decorate this year,) pack all gifts and any must-have items together. Leave the rest for next year. 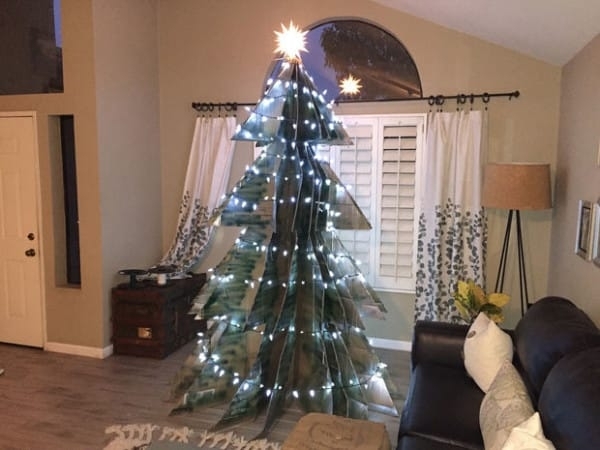 A Christmas tree made from old moving boxes. If you have children, it’s particularly important to be sensitive to their needs and fears, which may be heightened by the move. There may be some discussion and reassurances about Santa being able to find the new house, and whether or not we will be able to see Grandma as much because we’re moving further away. Children may ask these questions repeatedly, but the underlying, unasked question is whether or not the new home is going to be a safe, secure place. It’s the same thing the adults want to know. We are often amazed at the resilience of children with just a little bit of encouragement from their parents! So, be kind and generous when offering assurances. One thing about the holidays is that the traffic is heavy and the shops are full. So, grab those boxes and packing supplies early so they won’t run out and try to stay out of the stores during the busiest shopping times when you can. Holiday treats and music and well wishes can go a long way toward making things happy. If you want to pack a few special decorations for the new place, that’s fine. Just remember, you’ll be exhausted, and no one will resent the fact that you might not be able to go all out this year. While this might not be your most festive holiday season ever, you’ll get through and move on to enjoy many other holidays in the future.